After nine years with NASA and 136 days in space, Astronaut Jack Fischer is returning to the U.S. Air Force. His last day with NASA will be Thursday, May 31. Fischer, a colonel in the U.S. Air Force, was born in Louisville, Colorado. 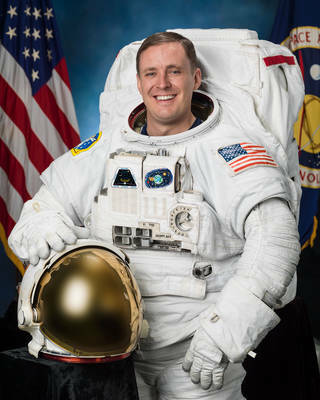 He earned a bachelor’s degree in astronautical engineering from the U.S. Air Force Academy, and a master’s degree in aeronautics and astronautics from the Massachusetts Institute of Technology. Fischer is an Air Force Command pilot with more than 3,000 flight hours in more than 45 types of aircraft. Fischer was selected in July 2009 as a member of the 20th NASA astronaut class, and completed astronaut candidate training in July 2011. He has worked in the CAPCOM (spacecraft communicator), Soyuz, International Space Station operations, space station integration, and exploration branches of the Astronaut Office. On April 20, 2017, Fischer launched aboard a Russian Soyuz rocket for a five-month mission to the International Space Station. He served as a flight engineer on Expeditions 51 and 52. During his time on orbit, he worked on hundreds of scientific experiments and conducted two spacewalks totaling 6 hours, 59 minutes. One spacewalk was to replace an avionics box and install a connector for the Alpha Magnetic Spectrometer and the other was to replace a failed critical computer relay box.